At the turn of each new year, the words of Tennyson always rings in my ears -“The Old Order changeth yielding place to the new and God fulfills himself in many ways! !” With a few minutes away from that moment of welcoming 2015, I am reflecting on 2014, the small joys, the little pains, the moments of happiness and those hopeless moments of sadness when tears rolled by for a dear one, some unknown sisters around the world whose modesty was outraged, for the happy families who embarked on a journey together and never made it to their destination, the unsuspecting young hearts in a school in a disturbed land who succumbed to bullets of the cruel and the several people who lost their possessions, their lives, their livelihood to nature’s fury and man made terror !! Cheers to a 2015 of peace, prosperity and happiness !! 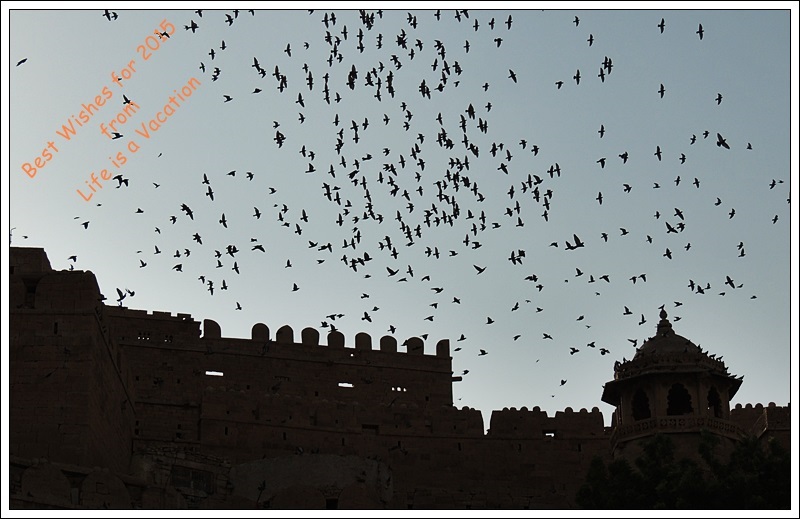 As I watched the flock of birds rushing towards the setting sun around Jaisalmer Fort , I wished for a pair of wings to fly high in the air without a care in the world. I wish each one of us find our wings this year to fly and to take a step in the direction of that source of joy that we are seeking !! The old order indeed changeth, yielding place to the new, lest one good custom should corrupt the world…, said Alexander Pope. So change it must. Your observations on the tragic events that unfolded in 2014 are so spot on, sangeetha. Let’s together wish for a 2015 of peace and happiness…best wishes…Raj.